Isaac Snowman was a British Jew who painted portraits and genre subjects, most with a Jewish theme. He lived most of his life in London and was educated at the City of London School. In 1890, he entered the Royal Academy School, where he won a free medal, and afterward a scholarship to the Institution of British Artists. Between 1893 and 1919, he exhibited 25 works at the Royal Academy, including: Tales of Grandfather, The Wailing Wall, Jerusalem, Slumber, and The Song of Songs. Isaac Snowman was married to Pearl Alexander at the North London Synagogue on September 13, 1898. According to some reports, the marriage was never a happy one. In 1897, Isaac Snowman participated in a pilgrimage to Palestine, and in 1907, he left for Africa to execute a commission for the King of Dahomey. Pearl filed for divorce on grounds of desertion and adultery. He eventually moved to Jerusalem, where he had a studio over the Damascus Gate. At the outbreak of World War ll, he went to London; poor health prevented him from returning to Israel. He died in London in 1947. 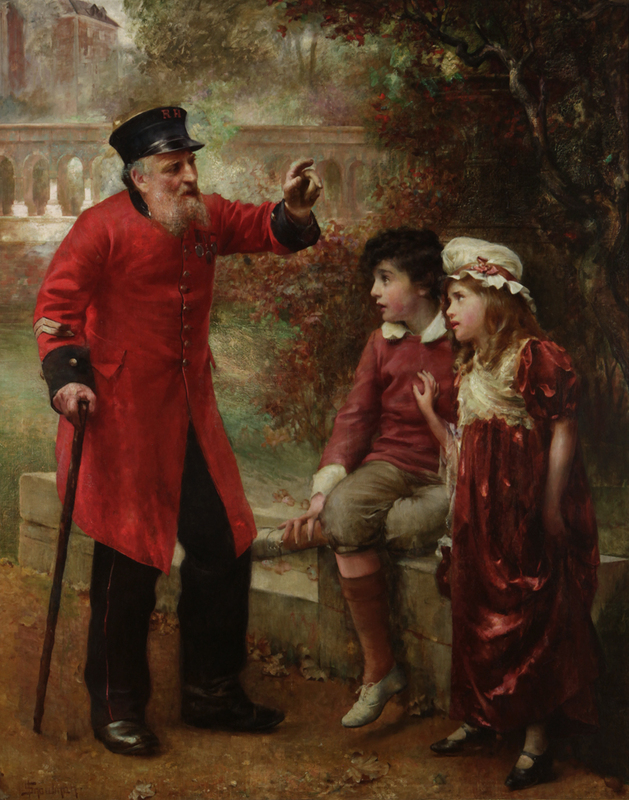 A Veteran’s Story is a dramatic painting of a Crimean War Veteran in his magnificent scarlet and black uniform describing his experience during this crucial campaign. Source: Bibliography: Dictionary of Victorian Artists by Christopher Wood and Jewish Artists: Signatures and Monograms, by John Castagno.